We globally source sustainable sugar, and, from our advanced UK sugar manufacturing facility, produce a wide range of pure sugar products that we deliver on time and in full to a range of international, and, UK customers. These include sugars (such as golden granulated and Demerara), refiners’ syrups (e.g. cane syrup, golden syrup and invert syrup) and treacle and molasses. We also have a team of sugar experts working in our lab to create special formulations (e.g. brewing sugars, sugar and glucose blends and products manufactured to a specific ratio of different sugars). We can produce pretty much any sugar you need, in any volume above 2,000 kilos, and ship it across the globe. Our UK sugar factory close to west London, has recently opened. It’s been designed to the latest food manufacturing standards, uses highly efficient processes and includes smart technology to ensure we deliver our pure sugars, glucose syrups and specialist blends on time and in full to customers. We supply artisan bakers and brewers to well-known blue chip global brands with sugar products that are used across the baking, brewing, confectionery, drinks and pharmaceutical, industries. 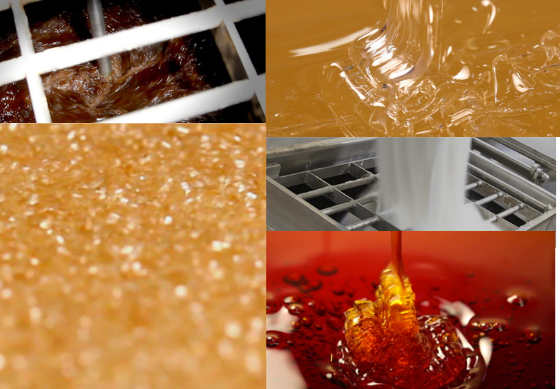 Our heritage dates back over 100 years and Ragus’ founder invented golden syrup. We’re proud of this history and our commitment to ethical operations ­– we provide ongoing consultancy and supervision to sugar plantations and suppliers overseas, supporting our commitment to the cause of sustainable sugar farming across the world in partnership with Bonsucro, Fairtrade and organic organisations.